Hogar Miguel León (HML) is an orphanage run by Catholic nuns for about 30-50 girls (and many of their brothers too!). You have to remember that instead of a foster care system, when children are removed from their homes and families, they go into orphanages. Therefore, every child has a different story and most have difficult backgrounds. Many of the kids have the opportunity to visit parents, aunts and uncles or grandparents during holidays and vacation times. Most volunteers find that HML is one of the most rewarding places to serve. Luckily we get to come here twice a week during the evenings. It’s near the center of Cuenca about 30 minutes from OSSO and as soon as you walk in the children gather around you and holler your name if they’ve met you before. The orphanage itself includes various buildings including an orphanage for the children, a rest home for older individuals and an old hospital. The ages of the children range from four to eighteen years old. 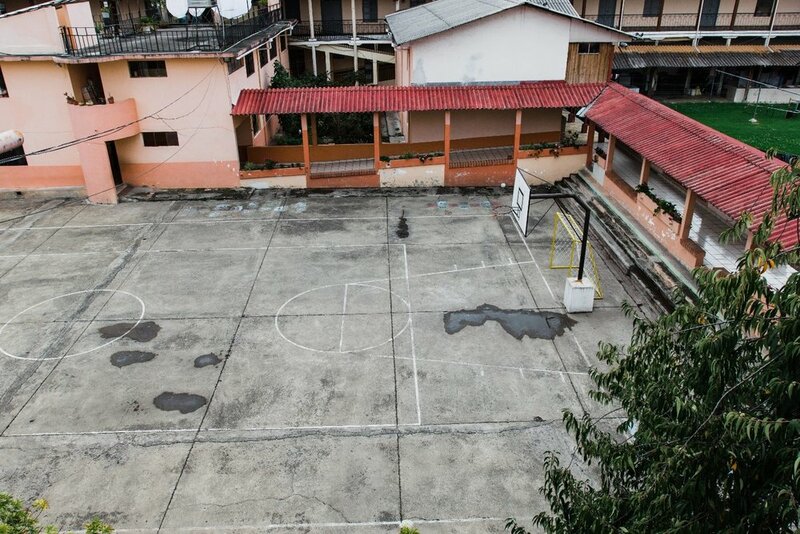 Most of them attend school; this includes Primaria (Kindergarten, Middle School, Junior High) or Colegio (High School). What your journal entry may read like after a shift here: Dear Diary, HML never fails to improve my day. Mondays and Thursdays are always long, but during the 30min ride home from HML I never regret having gone. Those girls are so sweet and loving. I think it may be my favorite place to go. Today was a craft night. One of the other volunteers was in charge of the activity. I’m in charge of Thursday’s activity which are outdoor activities. I’m thinking maybe musical chairs? Today instead of making a craft, we made chocolate banana smoothies. We split into stations to do it. The kids loved it! They soaked it up and they then ate it up. After making smoothies we had some time. I tried to chat with some of the girls. They kept asking me if I had a boyfriend. They try to say it in English. At first, I had no idea what they were trying to say and then I understood them. I’m going to miss these girls. I wish we could somehow stay in touch or get a picture with them, but I don’t think that’s possible. Can’t wait till Thursday to go to HML again!